I remember when carry on luggage was simply a bag of goodies you took into the aircraft cabin with you to keep yourself amused for a long flight. I used to relish handing over my suitcase(s) to the check-in person and walking away almost empty-handed. For longer trips away I still enjoy that. There is now, however, a change to the way we think about how we take our stuff with us. Checked in luggage is becoming less common as travellers try to make use of the free carry on option. these days queuing for stuff. Security checks for one thing. So people are focusing more and more on how they can get through the process and be on their way more quickly. Having only a cabin bag is ideal for this as you can bypass the baggage carousels and be on your way very quickly. Secondly, the advent of unbundling airfares has led to the option, on many airlines, of paying for what you want and not what you don’t want. One of the things that you often have to pay for is checked in baggage. Many travellers see this as an opportunity to be able to reduce their airfare cost. We can forego paying for meals and more desirable seats. In the same way, we can reduce the cost by carrying our bag into the cabin, not to mention the previous point of not having to wait for that last bag off the carousel at your destination. Now, believe it or not, the airlines have also noticed this trend. 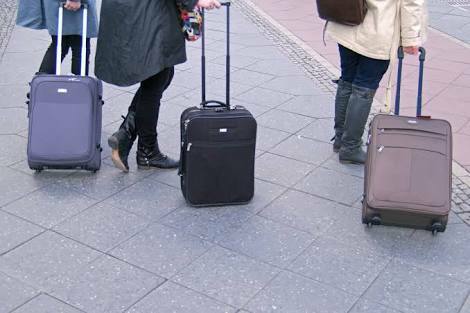 When the baggage trolleys start going out to the aircraft half empty and everyone is turning up to the boarding gate with wheelie bags, something is changing. Like any business, airlines hate people getting away with something for nothing. 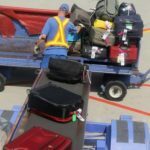 Responding to the trend of travellers choosing to take advantage of the free carry on luggage allowance, they have started to clamp down on this allowance. In times gone by, the boarding gate people would just let you go through with your bags, provided they looked like they might fit in the overhead locker or you didn’t look like you were carrying bags of cement. Be prepared to be asked to prove that your bag is within the airline requirements. seat in front of you. Yes, size does matter, but then so does weight. I wish we could say that there is a uniform rule about these weights and dimensions, but unfortunately, every airline has it’s own idea of what this should be. Checking the airline website is really the only sure fire way to know what that allowance is. This is easy if you are travelling on one airline all the way. What if, for example, you are travelling from Singapore to Copenhagen via London. You might get a nice generous allowance from Singapore to London and then on your low-cost carrier flight on to Copenhagen you get virtually nothing. This means of course that the meager allowance for the second sector becomes the governing factor for the whole trip. Unless of course, you anticipate consuming the difference on your first flight or posting the difference to Copenhagen from London. What do we need to think about if we are choosing to go down the cabin luggage only path? First off we need to be aware of all the things that are prohibited in the aircraft cabin. It would be a depressing start to the trip if many of our items were thrown out at the security check. So first off, make sure you check with your airline website to see what the prohibited items are. These are fairly standard these days, but things do change and it pays to know, as ignorance is no defence. Right? Smart packing is your friend. Think about what you actually need. Many of us over-pack, just in case, you know. With clothes try and make sure you wear your heavier clothes and that the lighter weight ones are in your cabin luggage compliant bag. For example boots, jeans, jackets, belts and coats can be worn or at least thrown over your arm, well maybe not the belts, jeans or boots. I’m not saying you do a Joey Tribbiani from Friends, but you get the picture. When you do pack your clothes, roll them instead of folding them. This ensures you can use all the space most effectively and also your clothes will be less wrinkled and ready to wear when you get to your destination. Now, toiletries. Of course, we know about the restriction on liquids in the aircraft cabin. The rule of thumb is no more than 100ml, but, yes I’m going to say it again, please make sure you check with your airline webpage to be completely sure. This means you need to pour the contents of your favourite shampoo, conditioner, etc into smaller 100ml plastic bottles. These can be purchased very cheaply and you can use them each time you travel. Make sure of course they close firmly as even in the aircraft cabin the difference in air pressure with ground level is significant enough to encourage liquids to try and leave the security of their container to go exploring in your clothes. Believe me, they prefer your clothes as it is very hard to get rid of things like shampoo and skin cream out of them. …..contain any random liquids or creams that make good their escape. 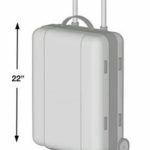 Check with the airline website to ensure you know the cabin bag acceptable dimensions. lock bag. The zip lock bag can be made to lie very flat among your clothes which is a great space saving technique. In addition, the plastic is more liquid proof than some toiletrie bags and can contain any random liquids or creams that make good their escape. When you do seal your zip lock bag, ensure you remove all possible air inside the bag as this will expand like a balloon as the cabin pressure reduces on climb out. Metal items are another area that care needs to be taken. Even though we know not to bring knives, scissors etc.. Care also needs to be taken to not include items that look like knives and scissors. For example, you can get tweezers that may have scissor type finger holes. These are to be avoided in favour of the tong style variety. What you have to think of is how it looks to the x-ray machine operator. You may well get them through security eventually but who needs the grief of having to unpack your bag to show them the offending item. It may just put them in a mood to examine other stuff or confiscate the item anyway. So what about our ever hungry electronic equipment? 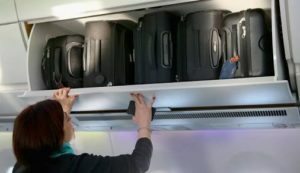 Cabin bag stowage in the overhead locker can work for everyone if you stow your case on its side with the bottom of the case against the back wall. So what about our ever hungry electronic equipment? No one needs the angst of thinking their gadgetry is going to run out of juice, but those plugs can weigh a bit. Consider perhaps taking only the cable part of the charger with the USB plug at the end. Most aircraft have the USB plug point for your flight, so that is covered. At your destination many hotels have USB points now, but if not smart TVs have them. If you do need to take one and your bag weight is getting up there, then maybe a jacket pocket could be the answer. This could apply to any smaller but weighty items like camera lenses and the like. So we’ve seen how it is possible to save on your next flights. Free cabin luggage is a boon for those who can squeeze their trip into a smaller bag. Let’s make the most of this while we can as you can be sure that airlines will come round to finding a way to charge for something we are currently getting for free. Please share any ideas you might have about maximising cabin luggage, we would love to hear them.